At first glance, setting up an affiliate system for your business sounds like a ton of work. There’s just so much you have to do! You need to have some way of allowing the creation and management of affiliate accounts. You need to track traffic coming in from affiliate sources, and you need to verify that the traffic is legitimate and not fraudulent. You need to come up with rewards for affiliate goals, be it incoming traffic, sales, or leads, and you need to assign payments for each of them. You need to track how much each individual earns, issue payments, deal with issues with payments, and avoid fraudulent information. It’s a lot! Thankfully, there are a bunch of different plug-and-play systems you can use. These are out of the box solutions that essentially allow you to install a plugin or app on your site to manage all of the above for you. I’ve found five of them you might be interested to try. Below, I’ve listed each of those five, the benefits and drawbacks, and my impression of making use of them. Also known as OSI Affiliate, Omnistar is one of the larger and more robust platforms you can use for managing an affiliate networking program for your business. Their system is used and recommended by Ninja Outreach, Piktochart, ResponseWise, and Trek, among 16,000 others. Their package contains all of the features you need from an affiliate system, including built-in fraud prevention, all of the account creation and tracking features you need, and plenty of data tracking to keep an eye on performance for your affiliates. In addition, OSI includes a social sharing widget to help social promotion of affiliate offers. It includes a coupon and discount code system and smart rewards to scale based on performance. You can set it to get customers to sign up and be rewarded for referrals, and you can run feedback surveys for your customers and your affiliates. OSI has four different tiers of plan you can use. They’re a flat monthly fee, so the better your affiliates perform, the more profit you can get out of each tier, and you don’t have to worry about the system taking a cut of your profits. The cheapest tier is $47 per month. You’re capped at 20K tracking requests and only 200 affiliates. On the plus side, you have a listing in their business directory, you’re free to use your own domain, and it’s free to set up the system. This is plenty for most small businesses, but if you need more affiliates or have more referrals to track, you need to bump up the plan. 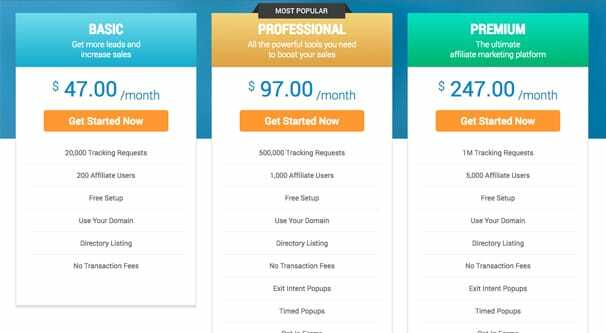 At $97 per month, you get half a million tracking requests and a full thousand affiliates. You also get additional conversion assistance systems like exit intent pop-overs, timed pop-overs, and opt-in forms, though all of those are elements you probably can get from other tools for free, so they aren’t that big a benefit. The larger business system is $247 per month and gives you a million tracking requests, five thousand affiliates, and all of the benefits of the other packages. It’s basically an expensive bump if you have need of that many referrals, which to be fair is a good problem to have. And, of course, the fourth level package is a scaling agency package; if you have need of that many resources, just talk to their sales team directly. 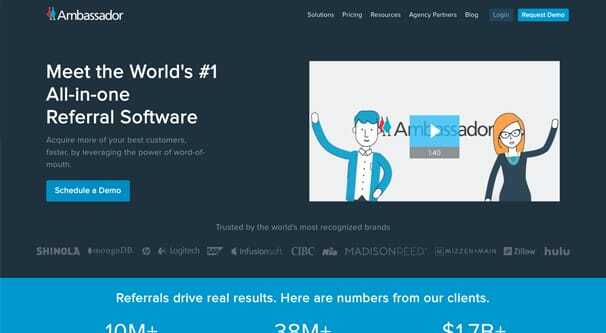 The Ambassador referral platform is another large, popular affiliate program used by a lot of different brands. They boast over 10 million affiliates registered, for brands like Hulu, Logitech, and Zillow. One of the primary benefits of Ambassador is the ability to segment your affiliates into groups, which can be given different sets of perks. It’s sort of like Amazon’s performance-based scaling, only you can set all kinds of different segmentation rules. I suppose I should say this up front: Ambassador is not for small businesses. This is your agency-level or larger system. They have a ton of different features, many of which you can’t get anywhere else, and their platform is extremely flexible and customizable to your specific needs and goals. On the other hand, the starter package is $800 per month. They call this perfect for small businesses; I call it overkill for the majority of my readers. Still, if you’re in the market for something more robust than my usual recommendations, this is a good place to start. What does that ridiculous price tag get you? Well, frankly, it’s a ton of stuff. You get a platform that works across multiple marketing channels and media sources, including on both desktop and mobile platforms. You get a system that allows you to set up a bunch of different referral marketing programs at once, including refer-a-friend systems for customers, partner programs for other businesses, affiliate programs for marketers, advocacy programs, and more all at once. You get access to premium-level support via phone and email. On top of all of this, you have access to both web hooks and their REST API, both of which allow you to create your own custom platform, dashboard, or app to access your system. It’s all white-label as well, so none of your employees have to know you didn’t develop the whole thing from scratch. So, like I said; it’s excessive, but also well worth the money if you’re in a position to use it. I absolutely would not recommend using it if you aren’t guaranteed to at least make your money back, of course. I mostly just list this as an option to show you what the gold standard is for a platform, against which you can compare the other entries on this list. This is one of the older available platforms, along with OSI. OSI is something like 13 years old, while iDev is 19. This means it has a long track record of being a solid, growing and improving platform you can use with your business. One of the unique elements of iDevAffiliate is the opportunity to choose either the self-hosted platform or a cloud-based platform. Cloud platforms always have their issues; you don’t control the back end or store the data, which is both a blessing and a curse depending on your own infrastructure. On the other hand, a cloud platform is reliant on remote access and uptime, which while good is not necessarily 100% perfect. The self-hosted version is a one-time fee of $199, which includes the software and license key for you to install on your site. It’s easy enough to install, and the lack of a recurring monthly fee is very nice. You only get a year’s worth of updates, though. Anyone looking at affiliate networks with their own site can use this, unless you’re a small business using a hosted site like a WordPress.com or Wix site. The cloud version has three packages, each of them running a monthly fee. All three of them have unlimited affiliates, unlimited traffic, and unlimited commissions, making them some of the most robust and unfettered platforms around. The only difference between them are the bundled plugins to expand the platform. 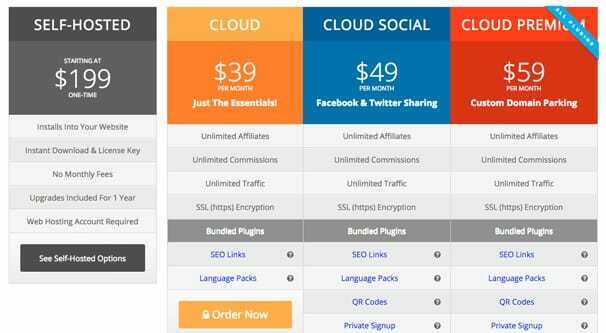 For $39 you get the base platform plus an SEO links plugin and a pack for additional language support. For $49 per month you get those plus a QR codes app, a private sign-up plugin, customizable coupon codes, and social media marketing plugins. For $59 you get all of that plus custom subdomains and geographic targeting. While iDevAffiliate might not be the cutting edge of affiliate platforms, and it might not have the most robust options, it’s still very solid. 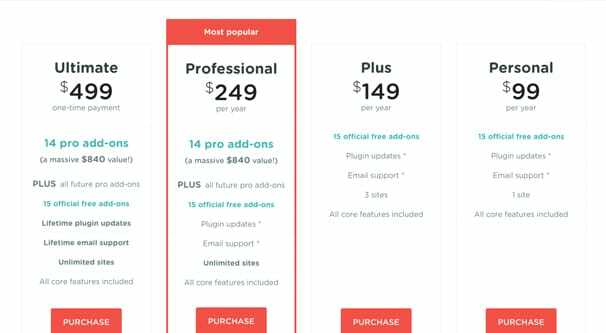 If you don’t need their plugins, their cheapest cloud hosted package is very nice with unlimited affiliates and commissions, which many other platforms don’t offer. Plus, the self-hosted app is only a one-time fee, which you can quickly make back and turn into pure profit. Plus, even if you have to re-buy it every year for more updates – which isn’t strictly necessary – it’s still cheaper than the cheapest cloud plan. 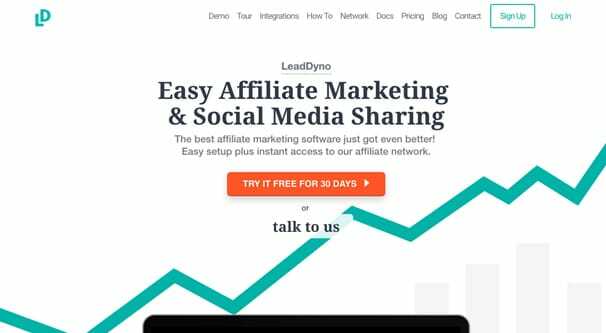 LeadDyno is a relatively new affiliate platform compared to the others on this list. They offer three packages with monthly fees, though they have a full month as a free trial, which is better than the other options I’ve listed so far. Unfortunately, rather than being limited based on commissions or based on number of affiliates, LeadDyno is limited based on the monthly unique visitors to your site. This means if you have a site with small commission products, you could reach a point where you’re paying more than you’re making, though that would take some extreme circumstances. The cheapest plan is $49 per month and is limited to sites with up to 3,000 monthly unique visitors. 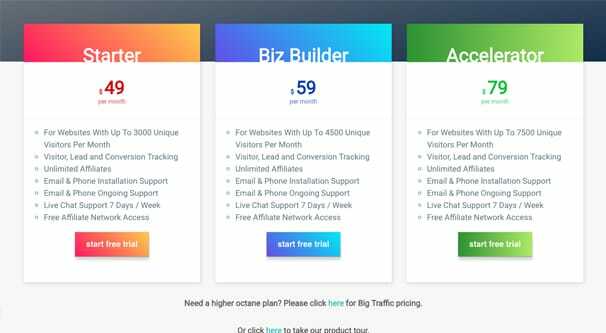 You get lead and conversion tracking, unlimited affiliates, and access to their affiliate network to find those affiliates. On the other hand, that’s pretty much it. Half of their features list is just varying forms of support. The two higher listed tiers are $59 and $79 per month, respectively. They have all of the same features, just higher limits. The cheaper of the two is up to 4,500 monthly unique visitors, while the higher of the two is up to 7,500. And, of course, they can scale up for an enterprise plan if you want. 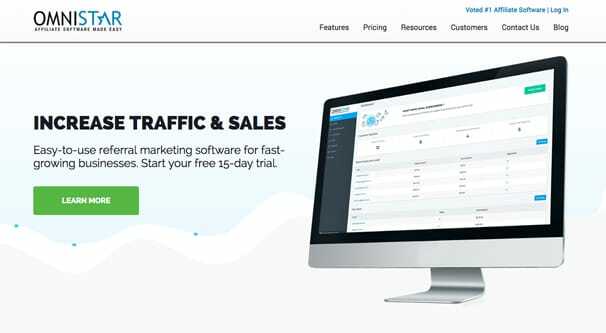 Given that they don’t have a ton of advanced features, this is a decent platform for small, out-of-the-box affiliate marketing and not a lot else. You can’t really do anything unique or extremely flexible like you can with Ambassador, though the cost being an order of magnitude smaller makes this still a viable choice. 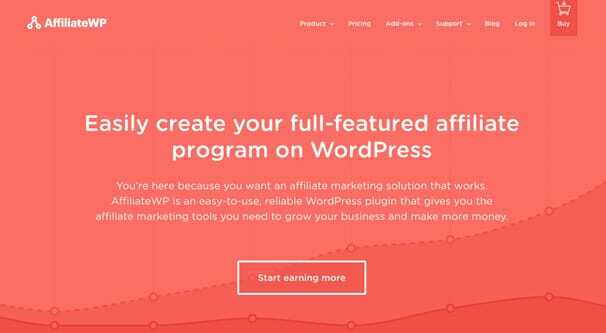 AffiliateWP, as the WP suggests, is a plugin for affiliate management that hooks into the WordPress CMS. If you’re using WordPress as your back-end system, which a lot of people are, this one is incredibly easy to get running and very intuitive to use. 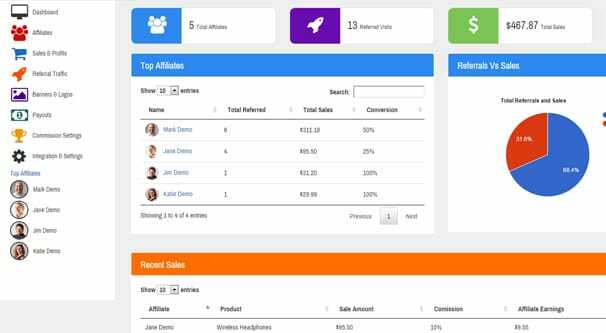 It puts all of your affiliate management features right in your WordPress dashboard, for ultimate convenience. 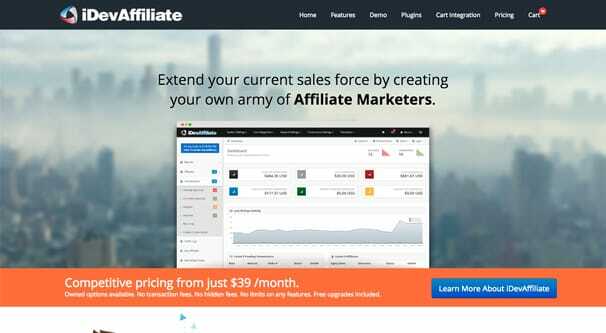 AffiliateWP works with the major WordPress e-commerce platforms, like Shopify and WooCommerce, as well as various membership system plugins. You get real-time reporting, unlimited affiliates, unlimited creatives in your library, and coupon tracking. You even provide a dashboard for your affiliates, distinct from your WordPress dashboard, so there’s no potential cross-viewing. AffiliateWP has four different packages. The first is $99 per year – not per month – and gives you access to their free add-ons and their core features, but is limited to one site per account. For $149 per year, you get three sites. For $249 per year, you get their 14 pro add-ons, access to any future pro add-ons they create, and can put it on unlimited sites. And if you go big with the $499 per year plan, you get lifetime updates, all their plugins forever, and unlimited support for as long as their company exists. When I mention add-ons, by the way, you should know what I’m talking about. The free-tier add-ons include things like tabs in the affiliate dashboard, affiliate info boxes, the ability to limit which products are eligible for commissions, shortcodes for affiliates, and affiliate leaderboards. 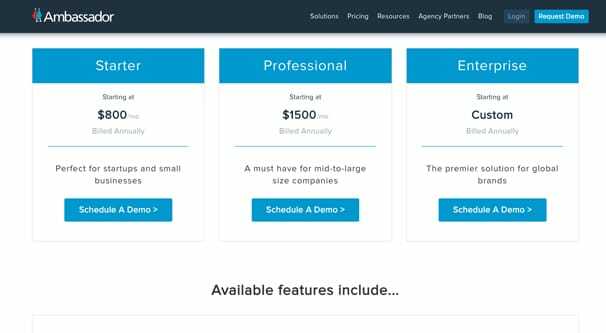 Pro-tier add-ons include options like Zapier integration, access to the REST API, landing pages for affiliates, and integrations with other apps like Ninja Forms or Gravity Forms. These may or may not be worthwhile, depending on what other systems you or your affiliates want to use. Did you find a system you want to use? If not, feel free to check out another list for some other options. There’s a little bit of overlap, but we’ve recommended a bunch of different products to look at, so you might find something you want there. Alternatively, if you have a favorite affiliate system you like using, feel free to let me know in the comments and I’ll check it out! Which Web Hosting Affiliate Program Pays the Most?